Home / ABOUT / What is Urban Wood? RECLAIMING URBAN AND COMMUNITY TREES FOR A SECOND LIFE AT THEIR HIGHEST USE. Urban trees have their highest value when living. Tens of thousands of trees are removed from urban municipalities each year due to construction, weather damage, insects, or disease. In the past, wood from these trees was typically seen as an expensive waste problem. Today there’s a movement to make use of the whole tree as part of a commitment to sustainable urban forestry. Some trees or portions of trees are best converted to wood chips or firewood. Others have trunks that can be rescued and processed into lumber. Urban wood lumber is a plentiful, local, and renewable resource with unique design characteristics. Urban environments offer opportunities to reclaim this beautifully unique wood for a variety of uses, including cabinetry, furniture, flooring, and interior finishes. Is urban wood different from traditional wood? 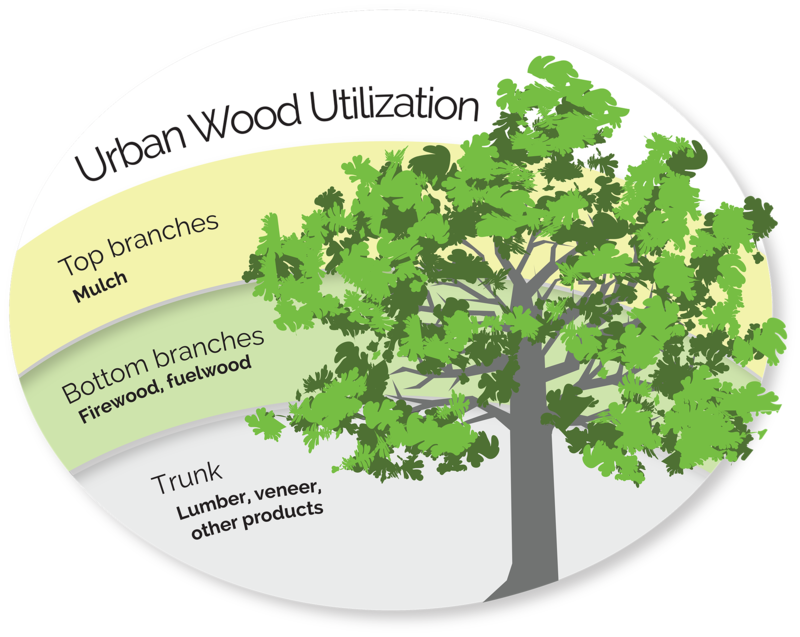 Urban wood lumber fills the same needs as traditional lumber, but the height and width of urban trees vary greatly because they grow in more unpredictable environments. Unlike traditionally managed timber, no two trees — or even boards of lumber — look much alike. While some urban lumber could be mistaken for the highest quality traditional forest products, other boards come from surprising species or show untraditional character. In other words, urban wood is beautifully unique. This adds variation to every order of urban wood lumber and is what makes it desirable for premium, handcrafted wood products. Urban wood is often used by woodworkers, designers, artists and homeowners seeking materials to create a special, customized look. Its beautifully unique appearance – Urban wood creates one-of-a-kind home products that reflect the personality of the homeowner and the region. To provide local support – Using wood from your own city or state supports local businesses and governments financially and environmentally. People can have a personal connection to products by knowing exactly where the wood was sourced. In honor of its history – Each piece of urban wood is connected to local history. For decades, each tree was a natural fixture in a park, along a street, in a backyard, or alongside a business. To reduce waste – Making use of the entire tree, from lumber and firewood to wood chips and sawdust is part of what makes the urban wood market sustainable. It’s a renewable resource – Urban wood annual tree plantings are much higher than the number of trees removed. According to the U.S. Forest Service, reclaimed wood from all dead and diseased community trees could equal nearly 4 billion board feet or about 30% of annual hardwood consumption in the United States.